I've been busy nearly all day on the pieces and parts of my first UFO #6. It's the lily block of Kourageous. 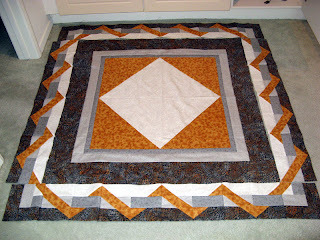 I'll be making a block as part of this UFO Challenge each month of 2011. There are 147 pieces in this finished 6" block. Each of the 23 parts have on average 6 pieces. It is incredible how tiny some of these pieces are. 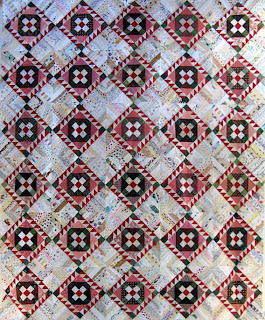 The pattern comes from 24 Flower Quilt Blocks by Linda Causee. I'll be using other's from this book as Kourageous comes together. The second designer that patterns will be used is from Claudia Hasenbach. 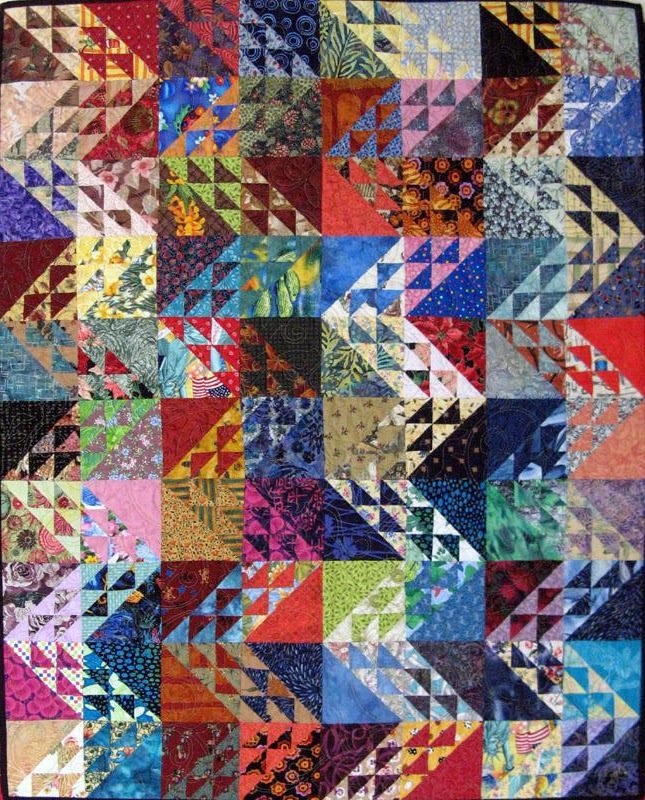 Most of Cluadia's patterns are part of her series "Big Quilt of Nature - Wildflowers". This one is due at the end of January! Yikes that's today! 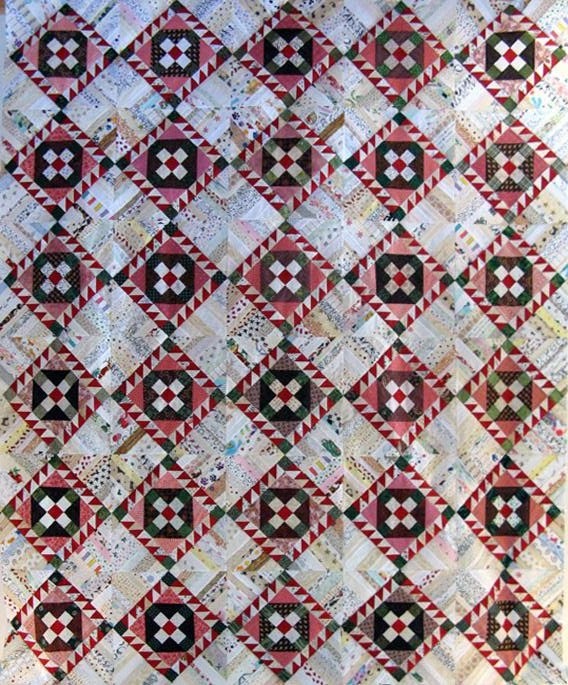 See other projects by all the quilters participating in this 2011 UFO Challenge at Patchwork Times. Just Friday I was mentioning how beautiful the weather was...wearing sunglasses and the car windows down while doing errands (sorry about it being 15' in some places). Today it is dreary, turned cooler and so far this morning we've only seen the sun poke out of the clouds for a few seconds. The car windows won't be down today. Today I've got nothing from my sewing room to show. I'm still working on my UFO that's due to be finished tomorrow. There is good progress on it and I'm fairly positive I'll have it done by tomorrow. There will be pictures of the Lily block for the Kourageous project tomorrow. Instead I'm going to share with you a couple of photos from 1975. Meet my Grandma, Alice Feldhaus as she sits proudly next to a quilt that's description is Betty Quilt. My Mom's name is Betty; not sure if this quilt is hers or not. 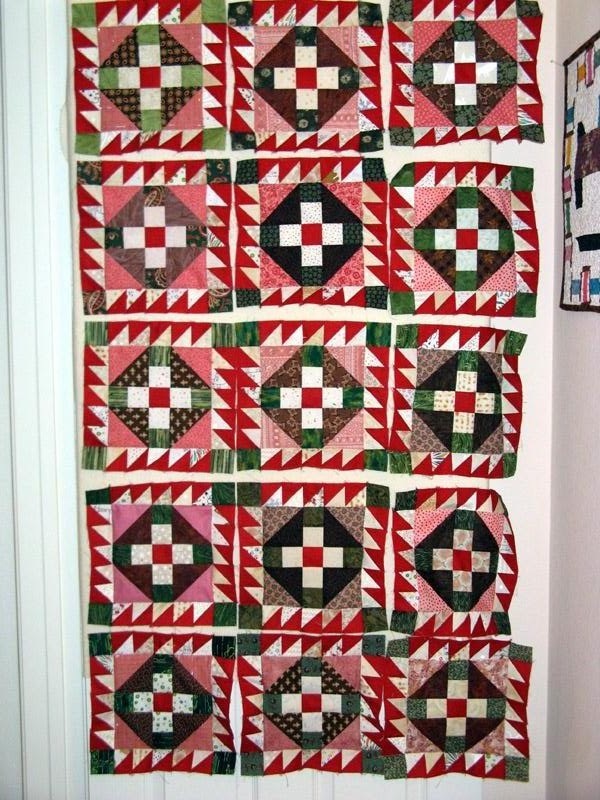 My Grandma made lots of quilts during her time and with the help of her Quilting Group got them quilted. 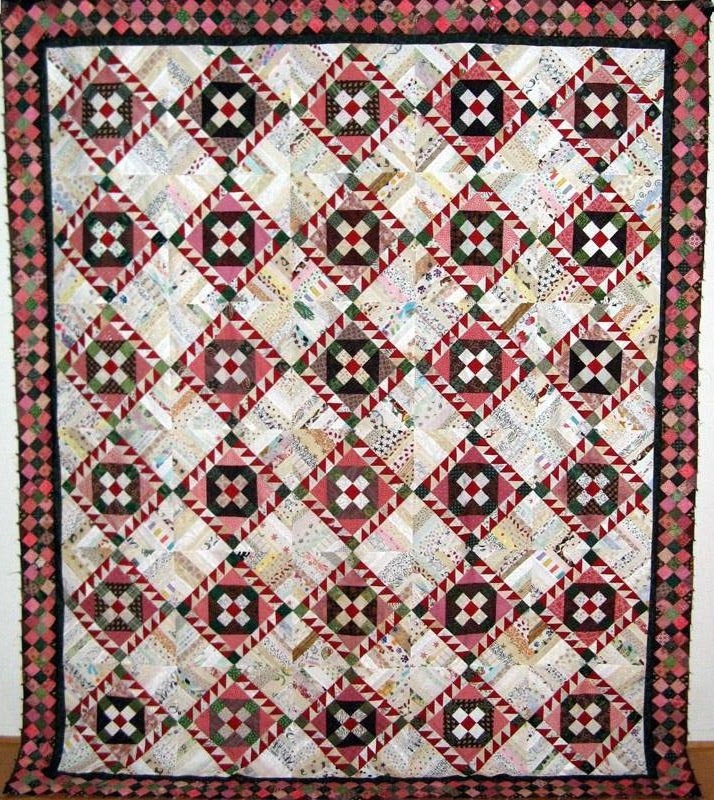 I have a couple that were quilted from this group that I'll share with you another time. Grandma is just to the left in the middle wearing the brown dress. The Quilting Group met at their church once a week as I recall. I remember once going to see them as they worked away. 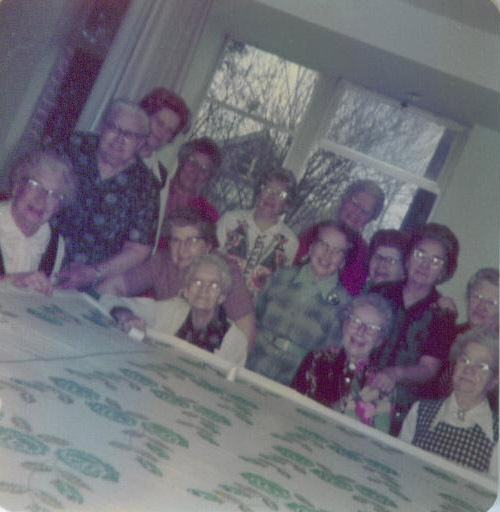 They all would work on the Group's quilting queue, first in first out. So if you finished a quilt you were added to the queue waiting your turn for you quilt to be quilted. My Grandma has been gone for awhile now, but she isn't too far from my mind. I'll bet she's happy seeing how I've become involved in one of the things she enjoyed so much. As for my stash report. I thought I might not have anything to report BUT turns out that's not the case. No, I didn't go to a quilt shop.... Instead I found a very large piece of fabric that will work perfect for the back of Kotton. So today I'm going to report in the "USED THIS WEEK" all the fabrics for Roll Roll, Cotton Boll project that's ready next for quilting! TGIF! It sure was a gorgeous day in San Diego. I had a chance to get out into it earlier than usual, around 1pm. I had a dentist appointment for a cleaning, so not so bad. Next I had my tires rotated to keep within warranty. Then to get printer ink where I had no luck finding what I needed, but not to worry another office supply store will have them. Next home to get Kaos and KoKo for a veterinarian appointment (time for annual shots). I'm getting Kaos ready for next week's teeth cleaning (KoKo was done late September last year). Kaos is not going to be particularly happy with me next Thursday! Between all of this running around I had my sunglasses on and the Honda's driver's side window down--just perfect! I was home with happy cats by 4pm. 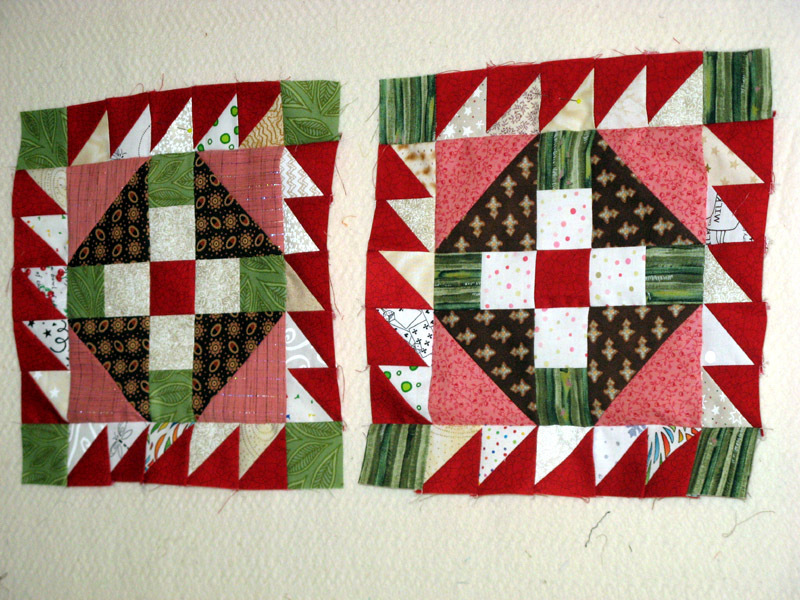 A look see at today's mail and then upstairs to finish putting the last pieced border and three remaining corners on Kottonwood Kurl! Didn't my Bonnie Hunter Mystery Roll Roll, Cotton Boll come out nice? I'm loving it! I'll be blogging on Sunday with progress on my January UFO and my Stash Report (I've been good this week how about you?). Tonight I'm posting my Design Wall Monday entry. 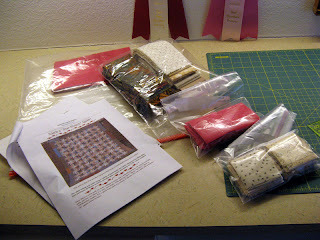 Yes, I'm a little behind since the weekend was having fun in Ontario at the Road to California Quilt Show. All of these projects are not on my design wall because the wall is just not big enough. And one you'll notice is on the floor, again because it's too big. Let me start with the project that demands my attention if I'm to get it done in the allotted time. January 31st is looming, beyond pulling fabric and reproducing the foundation pattern I have not done a thing. This is the first of several blocks that will make Kourageous. #6 was selected and that means the Lily block. I'll be making most of the flower with animal skin themed fabrics. 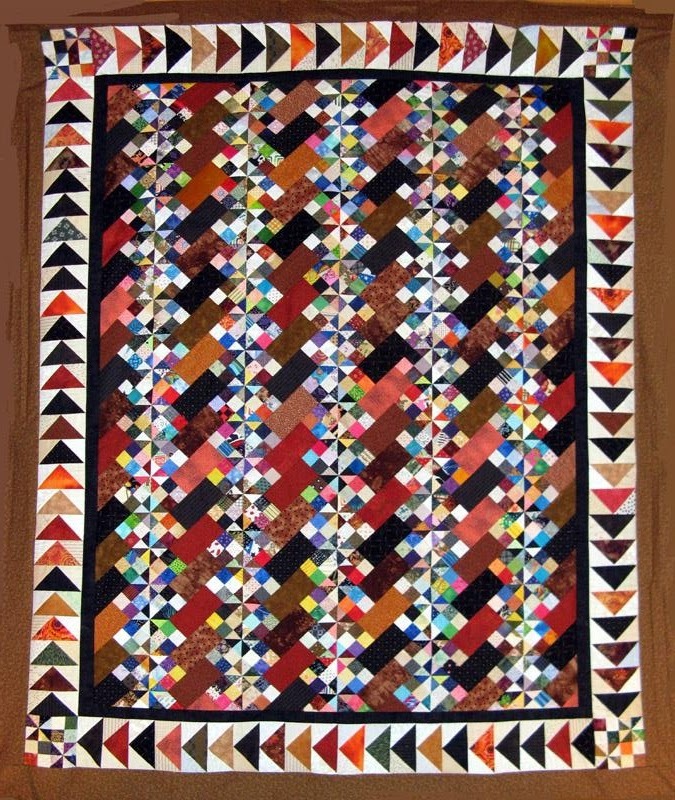 I've decided on the brownish black print batik to use as the quilts common background. 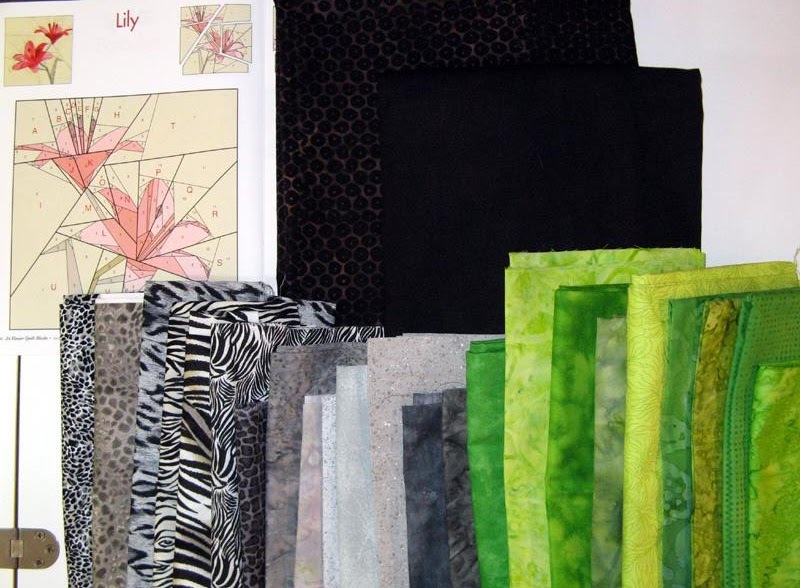 The Lily block will use the very first black and white cheetah print at least I think its a cheetah (closest to the bottom of the photo) along with the smallest zebra print, third gray (working from the bottom of the photo), the first dark gray and the next two greens. The pattern has lots of itty bitty pieces...taking a breath right here! Come back later this week and I'll have a progress report. Komet IS on my Design Wall (door), but only a small portion of it. If you know Bonnie Hunter you know what I'm talking about. Bonnie likes them big! This is Bonnie Hunter's Star Struck design. This one is third in my queue to work on. Lakeside Mystery II is pictured next and fourth in the sewing queue. Most of this was assembled during the workshop. 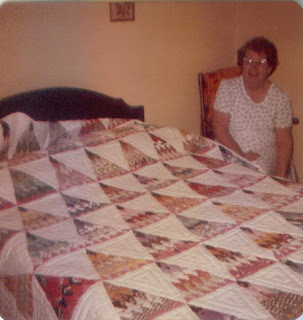 Notice the quilt is a medallion quilt. 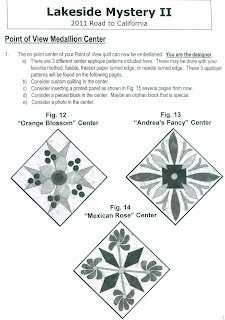 The center will be an applique design called "Orange Blossom" (Fig. 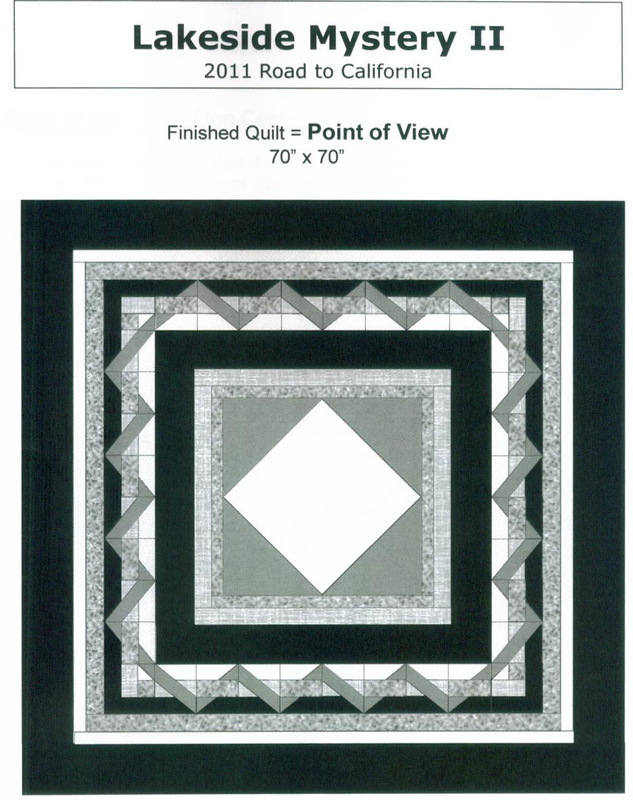 12) which is one of the patterns Cathy Farris provided in the pattern. The dark circles will be where I'll use Texture Magic. It will be a first for me to use the product so I'll take you through the journey with me. I've got the final three borders cut already; they'll be the medium dark gray, the light gray, and finally that BEAUTIFUL dark gray batik. 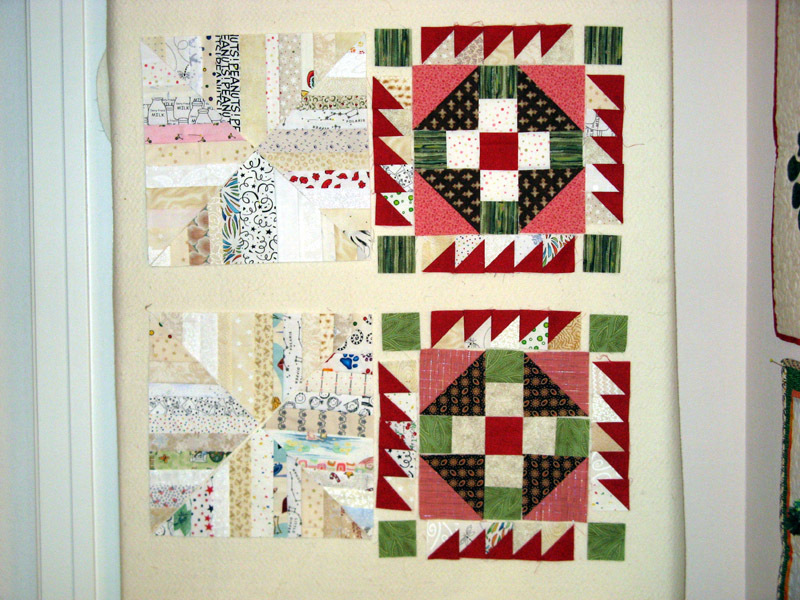 Not sure what fabrics will go into the applique; I'll figure that out as the project moves along. I am considering black for the dark circles to really give it some punch. Are there enough details for you to start considering a "K" name for this project? If you were counting my projects you might be wondering about what's second in my sewing queue. I've just got to get back to Kotton my Roll Roll, Cotton Boll Bonnie Hunter Mystery that's just finished. I'm so close but my January 31st deadline demands my attention--you never know what surprises might come along! 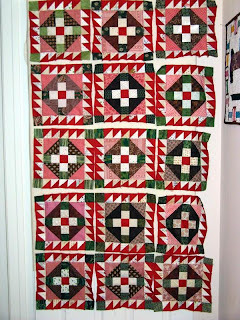 See other Design Walls that were posted at Patchwork Times with the link on my side bar. Happy Sewing! 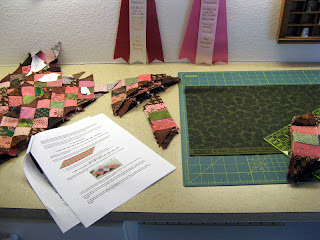 Posting late this week since I was attending Road to California Quilt Show over the weekend. I drove up on Saturday morning with Kerry to arrive when the doors opened at 9:30am. We spent the next several hours admiring all the beautiful quilts and shopping the terrific vendor mall. I didn't do too much damage to my wallet, but alas I do have some yardage to add this week. 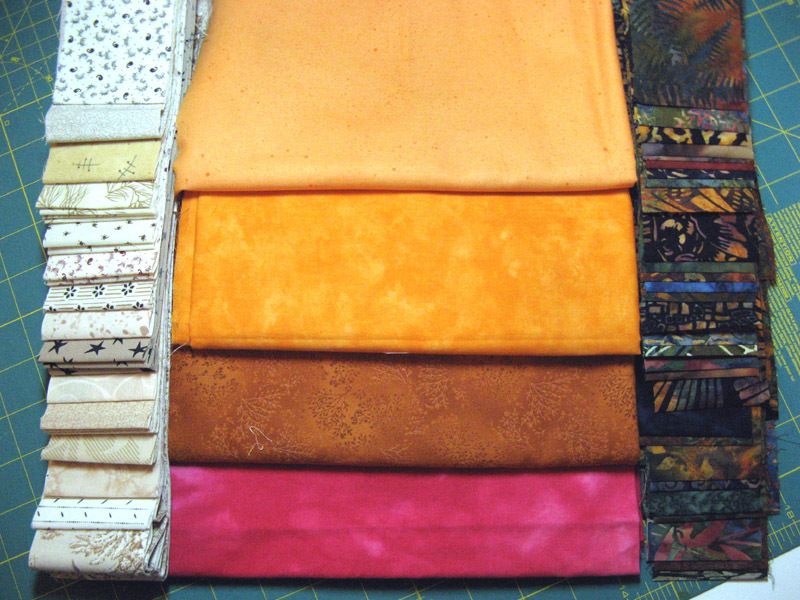 I came home with fabric for my Kourageous project, cheddar fabric to enhance my stash, a bag of batik neutral scraps, the Ichabod Hollow quilt pattern, a spool of neutral thread, a KAI pair of scissors, and a package of Texture Magic. First let me say that I'm mosted excited about my KAI scissors purchase. These are 6" scissors from the Patchwork Scissors collection. What makes them really nice is the Micro Serration on the blades. They honestly "hug or hold" your fabric when you use them. I have a pair of KAI 5" scissors that I use all the time next to my machine that I just love so I was pretty sure I'd be completely happy with this pair. 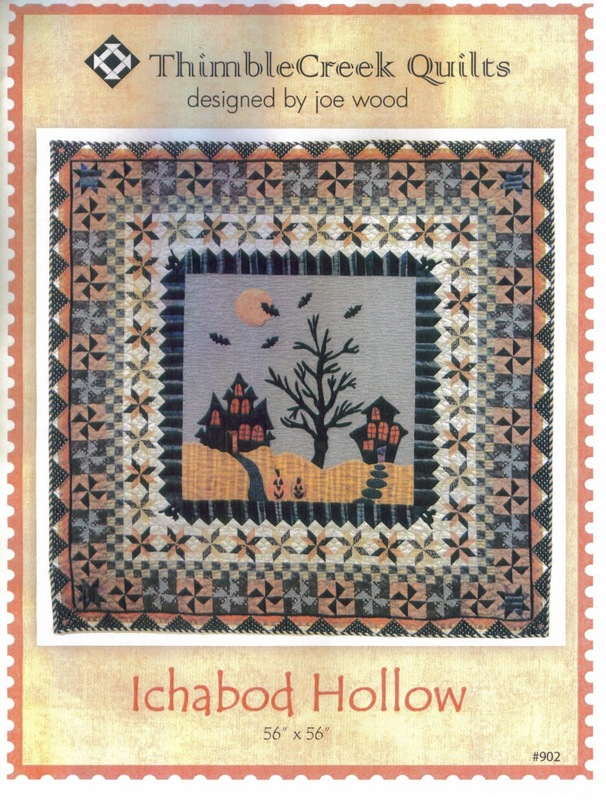 The Ichabod Hollow kits were sold out when I first found it; not that I would have purchased a kit anyway but this provides you an idea of how popular it was. The Sew Batik scrap bag is something I had not seen before at one of my most favorite vendors. Sew Batik packages 2 yards of scraps with nothing in the package less than a 2" wide WOF strip. I couldn't pass up the neutral package at $9 for the bag. I wasn't disappointed when I opened the package and do plan on another purchase sometime in the future when the scraps will be different neutrals. So let's move on to my first workshop, Lakeside Mystery II by Cathy Farris. Me in action! 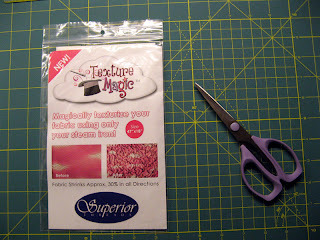 The Texture Magic by Superior Threads that I purchased will be for this project. This product is neat as it magically texturizes your fabric using only your steam iron. I'll be talking more about it as my project is being worked on. It was a fun class that was from 6pm to midnight on Saturday night. We woke up early to attend the second workshop Star Struck with Bonnie Hunter. Me again in action! A special thanks to one of my classmates. She was making her Star Struck with animal prints....remember my Kourageous project? 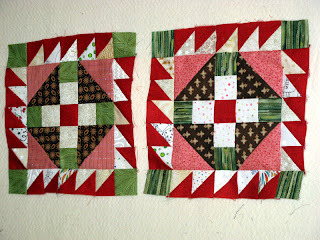 She gave me the scraps on the far right pictured in the fabric photo. I'm certain to use these in one of the many blocks. 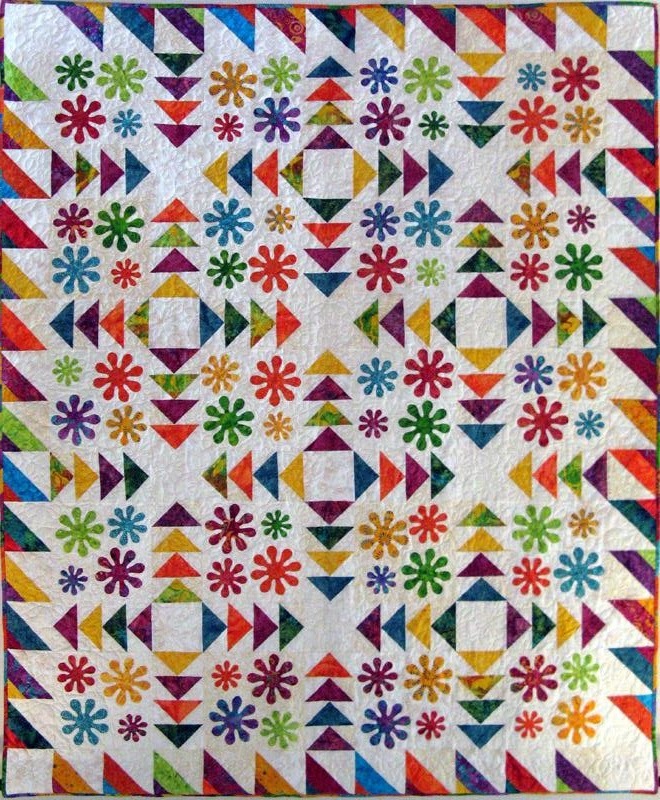 Komet as my Star Struck will be called is third in queue on my sewing table after my January UFO finish (Kourageous Lily block) and Roll Roll, Cotton Boll (Kottonwood Kurl) is completely assembled. It just happened to be Bonnie's birthday so Kerry and I arranged for a cake. It was a yummy white cake with fresh strawberries as the filling that everyone enjoyed. 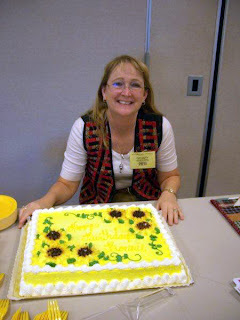 It was fun meeting some of my blog followers and fellow Quiltville Chat friends. The day ended around 5pm with new projects, experiences, and friends. What a great weekend! TGIF! 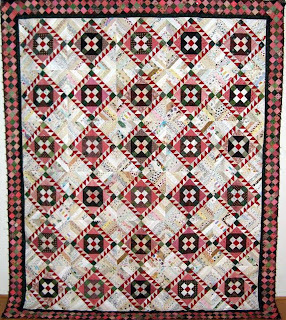 A superb one too because it's one of my OFF Fridays and Road to California Quilt Show is this weekend. I'm leaving bright and early from San Diego for the not too far drive to Ontario to arrive when the doors open at 9:30am. We'll check in at the show for our two workshops and then see the show. Of course we'll have to visit the vendor mall. I wonder what wonderful new things are out there to be scooped up! I don't have anything particular that I'm looking for, but not likely that it will stop me from opening up my wallet... guaranteed! Hope my stats don't look too bad when I post my Sunday Stash Report on Patchwork Times this week. First workshop starts at 6pm and goes until midnight on Saturday! It's sort of a Quilters Night Out this workshop the Lakeside Mystery II with Cathy Farris. My fabrics are four different shades of gray and a goldish color. We'll see what comes from this mystery project! Second workshop is on Sunday from 8:30am until 4:30pm with Bonnie Hunter. We'll be making her Star Struck design. Mine will of course be scrappy fabrics with one constant hot pink as the accent. 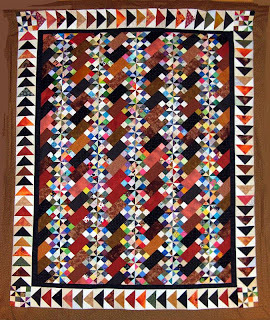 Komet will be this quilts name. Oh boy! Just love Bonnie's designs and can hardly wait to start into this one. I've continued working on Kottonwood Kurl (Roll Roll, Cotton Boll by Bonnie Hunter). 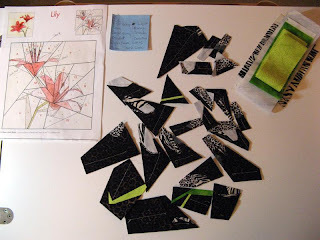 I'm on the assembly of the last pieced border. I found in my stash what I'll be using for the inner border, yeah. I'm also already pulling fabrics for the 10 1/2" blocks I'll need for the back. Stash Users System all the way baby!!!! I've got absolutely no progress to report on Kourageous UFO #6 Lily block. It is waiting it's turn on my sewing table. Rest assured that I'll make the end of January deadline! Bonnie's stay with me this week was great. She is just the person you'd think she'd be from all she writes. If you happen to be at Road to California Quilt Show on Sunday make sure you stop by her classroom and wish her a Happy Birthday! My Visit to San Diego! I thought it only fitting (and a bit fun) for me to post here from Sandi’s blog since I have been staying here at her house during my visit! Isn’t this little beast just gorgeous!? His name is Komotion--KoKo for short! Look at that coat! They are still pretty shy around me, but I know which one loves ice cream off the end of my finger! This sweet little girl is named KAOS was so shy she was hiding up on the shelf in amongst the stereo equipment! Snuck in there and took her picture anyway! We had a great adventure yesterday with the Whale Watching! We couldn’t have asked for better weather. And I lost count of the number of whales we saw after we hit 8….the only thing I’m bummed at is when I went to upload the little videos I did on my camera, I got “error” messages on them ALL so I don’t know if it’s the software on my laptop that isn’t reading them, or if there was really an error. I’ll have to wait til I get home to see if I can get them to work from there. We saw LOTS of playful dolphins…they are so fun to watch…speedy little demons, they love to play in the wake as we cruised…..I think they were my favorite! We had some good gray whale sightings. It was amazing to watch for their blow spray and see their humps just above the waterline…you could kind of track their movement in the water, trying to anticipate where they would surface next for another breath. Fascinating! Gorgeous view of the skyline as we headed out of the bay and into open water! Can you see the lighthouse there on the tip of the peninsula? Such a lovely day! This picture turned out better than I hoped! I now have it set as my desktop background…tall ships sail so silently, and are wonderful to watch! I bet this is just what the view was in the harbor 150 years ago and before. windy and breezy, it was a great day for some sunglasses and a ponytail to keep whipping hair at bay! FISH TACOS!! Oh, these were SO good bad! We sat out on the patio right up against the water and just enjoyed the view. Me, with a statue of a WWII Flyboy at the Bob Hope Monument! More of the other statues….can you guess which one is me? LOL! And you can see part of the ship MIDWAY there in the water behind me. And this statue “The Kiss” was my favorite of all! Who wouldn’t recognize this statue from the timeless WWII picture? It’s HUGE!! Again, you can see the tip of the Midway there to the right in the pic. And here it is at the pier. It’s HUGE! There are all of those planes and helicopters on top. I can’t imagine what it would be like to live on an aircraft carrier for months at a time in open sea. I’d love to come back and actually tour it the next time I’m in the area ---which will be January 2012! Be ready for me, I’m coming back! The guild meeting was terrific last night and I have to thank the Canyon Quilters for such a warm and wonderful welcome. I wish I had more time to spend here, but I’m being driven up to Ontario this morning to get set up for the Road to California Quilt Show which starts tomorrow! Whooooot! 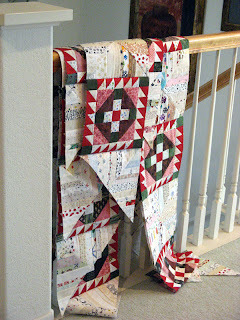 And a special thanks to Sandi for taking this crazy quilter into her home and sharing her space with me! 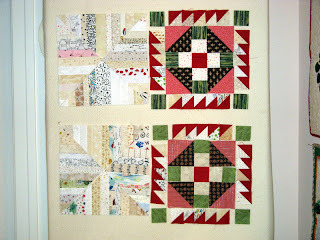 Hope to catch you next time over at MY blog, Quiltville! My design wall has Kotton at Clue 7 (aka Roll Roll, Cotton Boll by Bonnie Hunter). I've got Clue 8 ready to put together tomorrow; well at least get started on. The last clue puts on the borders. This project has been lots of fun. Bonnie kept us all guessing most of this mystery. As she does with all her projects...eliminating stash is great...and the designs are always perfect. Give Bonnie a try if you haven't done so already. 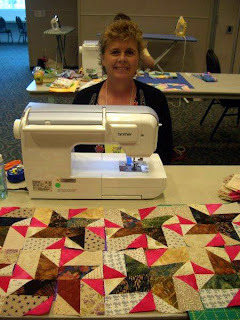 Speaking of Bonnie, she is doing a lecture at my guild tonight (Canyon Quilters of San Diego). The lecture is on her famous Stash User System. I am hostess for her two night stay while she is in San Diego. It is her first visit to our city so we will be doing a little touristy things later this morning. The weather is great with temperatures in the 70's. I'll let her blog fill you in as I'm sure she will have lots to share when she finds the time. 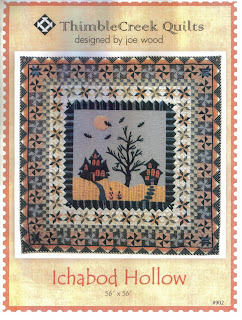 Check out other Design Walls this week on Patchwork Times. So how's your stash being reduced this week? Mine NOT! I'm still working on my Kotton (aka Roll Roll, Cotton Boll by Bonnie Hunter). Yes I know the last Clue was released a couple of weeks ago, but work and preparing for a special house guest have been my priorities of late. The weather has been beautiful this weekend and continues this way through Monday. Just perfect for my guest who is coming from the East Coast. Clue 7 is what I've been able to work on during the week. I'm trying to get it finished before I move on to errands of the day and the 5:44pm arrival of my East Coast guest. Here's where I am this morning. I have one more vertical row to sew together and then it's time to sew the rows together. Trim the edges to 1/4" and a finish to Clue 7. You can see from my sewing table that Clue 8 parts are waiting me next. I'm going to close this report with no change from last week. The weekend ahead is Road to California Quilt Show in Ontario, California. I'll be taking two workshops. One is the Lakeside Mystery II (the purchase this week) on Saturday night. 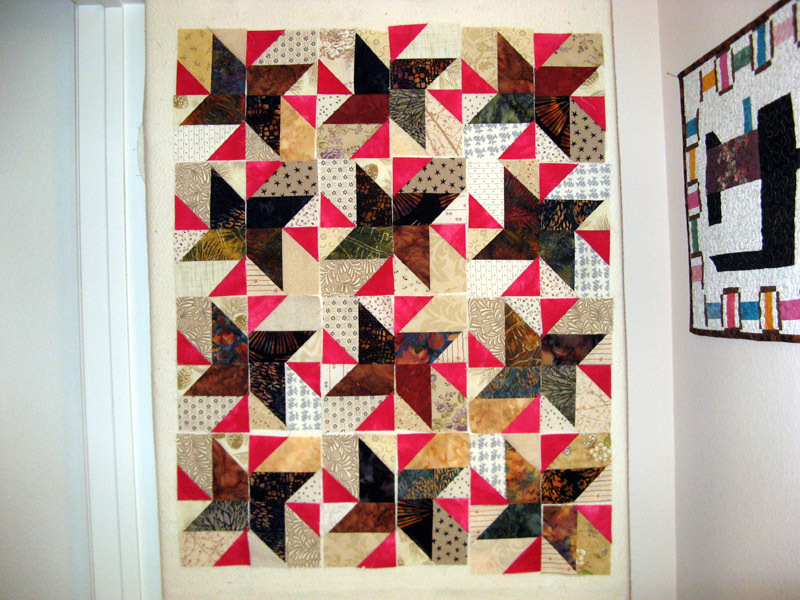 This will be fun sewing from 6pm to midnight with Cathy Farris and a bunch of fun loving quilters. I've got my kit ready to go that included some precutting and sewing. This one will be in four shades of gray ranging from light to dark and an accent burnt gold. 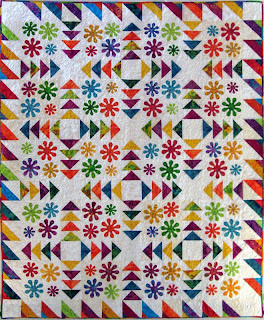 The other workshop is with Bonnie Hunter on Sunday where she takes us through Star Struck (mine to be called Komet). For this project I'll be using scarps...did you expect anything different? I have the darkest strips from a Bali Pops butterscotch pack along with light beige strips for the neutral background and a hot pink for the accent. The weekend ahead is sure to be fun. Come visit me again tomorrow and I'll reveal who my special house guest is. It is someone all of you know! Okay, I'll give you a small clue...She's coming from North Carolina. The purchase this week was for the fabric need for the Lakeside Mystery II workshop. 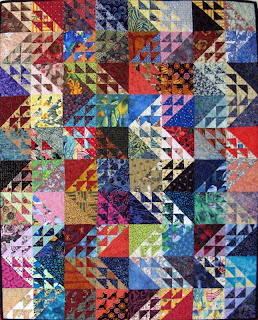 Check out more Stash Reports through Patchwork Times. 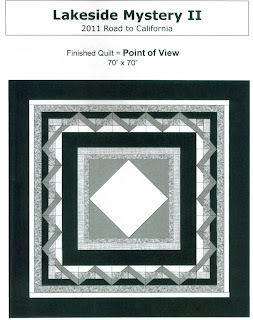 This is Clay's Choice the block made for Sunshine Quilt Guild's January BOM. Participants were provided the dark blue fabric then add a jewel tone and background fabric. Nice easy design--not the winner this month :(! Old Tobacco Road has been named Kamel Kountry...I had a few suggestions for a "K" name... I have to share a cute story I learned about from Dee. Her DH spent about an hour trying to think of "K" words that went with tobacco. He came up with Kentucky Burley, type of tobacco and Keg which was used to pack the tobacco in to transport to the processing plant. Great ideas Bill! 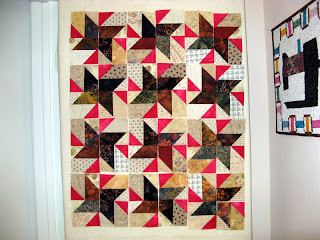 Another decision reached is the focus fabric for the Star Struck workshop I will take with Bonnie Hunter next Sunday. Overwhelmingly the suggested color is that hot pink. I thought I was too far out of the box, but guess not. Thanks for your comments. So to conclude this post and get some sewing done...I finished up three of my "deadline items" that I listed on Monday. Fortunately nothing was added too, which is a good thing. Roll Roll, Cotton Boll Clue 7 still needs finishing and Clue 8 is waiting too. Oh and I've got my UFO #6 to get to as well....so little time....so much to get done! Have a wonderful rest of the week; happy sewing. A brand new week ahead! I have guests coming tonight to watch the college bowl game with Oregon. DH plans to pick up Mexican at a local fast food restaurant for dinner; works for me! This means that there probably won't be any sewing or if any very little. Not the best time for this gathering since I'm so far behind where I'd like to be in my sewing projects. I am looking forward to our gathering nonetheless. I did make lots of progress on a few of my "must dos" yesterday. 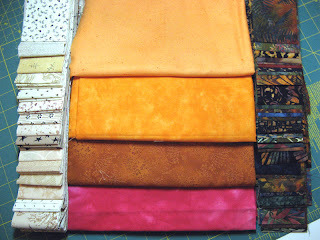 I went to Rosie's; selecting fabric for my Lakeside Mystery II project. 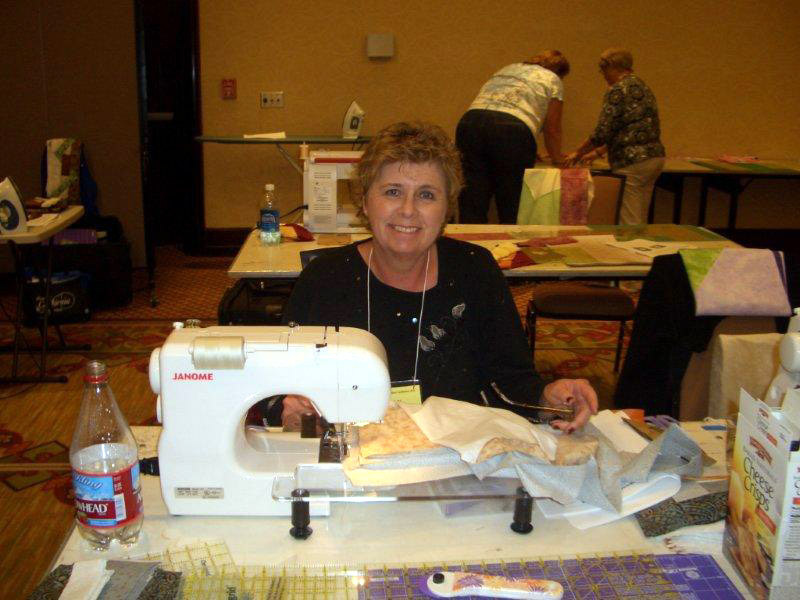 The workshop is with Cathy Farris on Saturday, 1/22 at Road to California Quilters Conference and Showcase in Ontario, CA. It starts a 6pm and goes until midnight with the instructor. 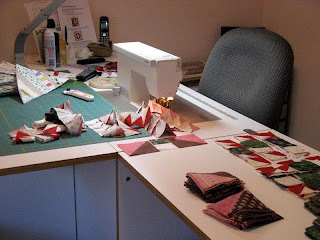 It is lots of fun staying up late and sewing with a bunch of quilters! Here are my fabric choices. Five fabrics are called for; a Light, Light Medium, Medium, Dark Medium, and Dark. I didn't show much of the Dark but it has some of the Medium color throughout. As you do with mysteries; I've got my fingers crossed that my selections are sound. Two come from my stash one from a gift certificate, and the other two purchased. 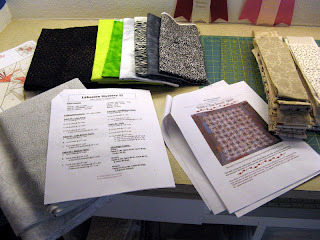 Another forward movement in my "must dos" is the selection from my stash of fabrics for the Star-Struck project that I will attend with Bonnie Hunter on Sunday, 1/23 also at Road to California. I'm auditioning the middle fabrics. I only need one accent fabric. I sort of like the hot pink, but it might be to far outside the "box". One of the oranges might be a better choice. I'll be thinking about this one before I move forward to the cutting. Which one do you like? And what do you think of Komet for it's name? The last project to move along is Kotton (aka Roll Roll, Cotton Boll by Bonnie Hunter). I've got only 15 more Block 2s to assemble and then it's to the ironing board I go. Here are the first 15 on my design wall today. 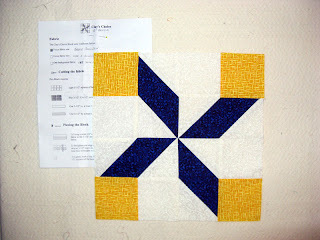 I'll be staying up late enough to get my Sunshine Block of the Month done for Tuesday's guild meeting. The start of another week is upon us. I'm quite anxious to sew today. I've got so much to catch up with. Today I start my morning with working on Clue 7 of Kotton (aka Roll Roll, Cotton Boll). I have so many other projects in work and preparing for that I'm feeling somewhat frazzled. I know you've been there too. I've got Kotton going along with 1) Sunshine's BOM due Tuesday; 2) first 2011 UFO #6 project Kourageous due end of the month; 3) Clue 8 of Kotton waiting; 4) preparation of Star-Struck project due by 1/21; and 5) preparation of Lakeside Mystery II due by 1/21. As you can see I am making some progress on all of them, but I'd sure like some of them to be done. The one I want to work most is the one with no due date...don't you find that to often be the case. 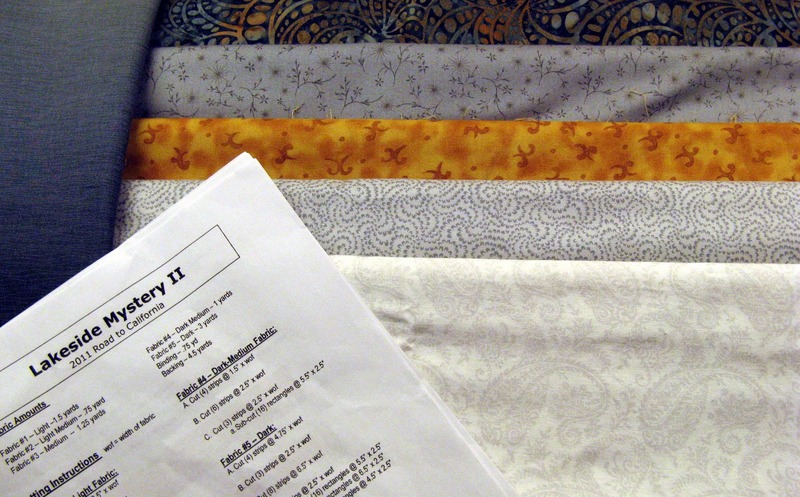 Star-Struck and Lakeside Mystery II are the two workshops I'll be taking at Road to California Quilt Show in two weeks. I need to find a fabric that goes with the two grays for the Lakeside Mystery II project that I'm hoping to use. I will be using my Rosie's Gift Card received at Christmas for the purchase since my stash doesn't have anything that will work. 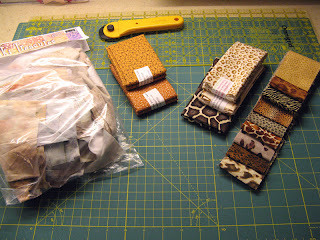 Star-Struck will be another scrappy project that my stash will certainly accommodate. So my numbers this week are as they were last week. This will change as soon as I can get some things done! Missed posting at mid week as I'd like, but one day late isn't too bad. I have been very busy "at the job that pays my bills" :(. I've had no time to get home before dark and even exercise. So honestly I'm not slacking, just too busy and then too tired to do much more. But, this work week has concluded as tomorrow is my bi-weekly day off...YIPPEE! I have been hand sewing and watching a couple of movies with DH. Viewed and thoroughly enjoyed Knight and Day on Monday and Sorcerers Apprentice on Wednesday. Tonight after cleaning up from dinner I'm catching up on my blog. The hand sewing has Kollette finished except label and is now hanging in my hallway. Nice spring like looking design. 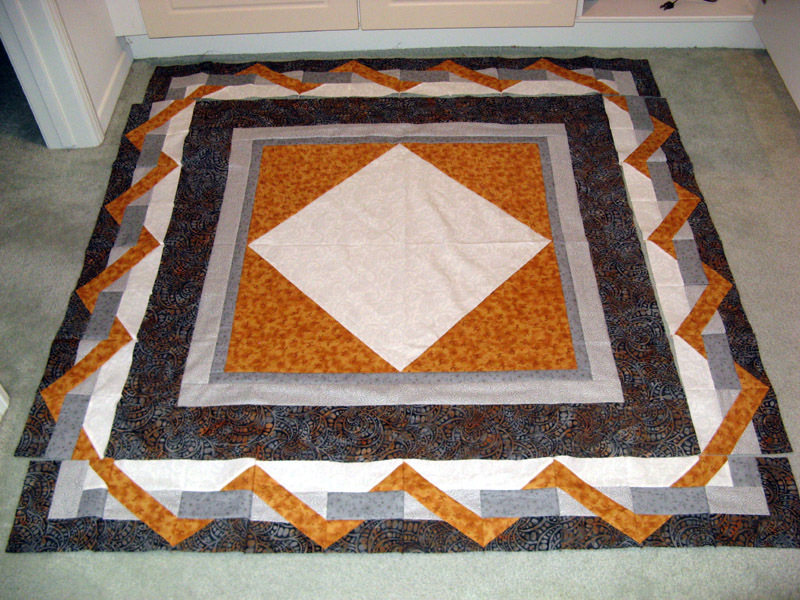 Kollette is one of my UFO Pattern projects from 2010. I've also been hand sewing and should finish tonight Katerpillar which is one of my UFO Projects from 2010. Roll Roll, Cotton Boll (my Kottonwood Kurl) has been boiling since Sunday on Clue 7. I've got some of it done, but not nearly enough to be ready for the final Clue 8 that Bonnie will release tomorrow morning during the wee hours of the morning. With a little bit of luck I'm targeting to be done with Clue 7 and a significant start on Clue 8 by days end on Friday. 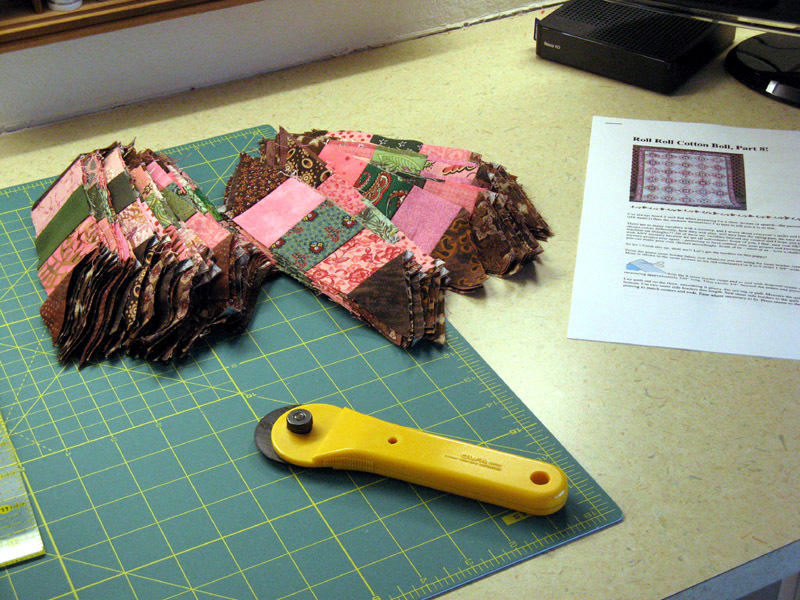 No progress at all on my Kourageous, #6 2011 UFO with Patchwork Times...well unless you want to call pulling the fabrics I plan to use and preparing the foundation pattern on paper. This one will be a doozy as it has really itty bitty pieces where my add 1/8" ruler will definitely be needed. I have been busy online purchasing some additional flower patterns to add to my "jungle". Last but not least is my BOM for Sunshine Quilt Guild that meets on Tuesday evening of next week that I've not even removed from the baggie it came to me in. I sure am glad that this is a three day weekend for me.... I'll add pictures a bit later of Kollette and Katerpillar. With a little luck the finish of Clue 7 and progress on Clue 8 on Kottonwood Kurl. The BOM deadline is looming so it will find it's way into my sewing weekend madness. Hope your week has been more productive in the sewing room than mine. Today I have on my design wall the first few blocks of Bonnie Hunter's current mystery Roll Roll, Cotton Boll (there's a link on the button at the right). Block 1 is on the right; Block 2 is on the left. Block 1 is a combination of many of the clues and Block 2 is ONLY Clue 3. There is still a section from Clue 6 where a home hasn't been revealed...wonder if it is part of the borders? Only one more clue to be released this Friday! 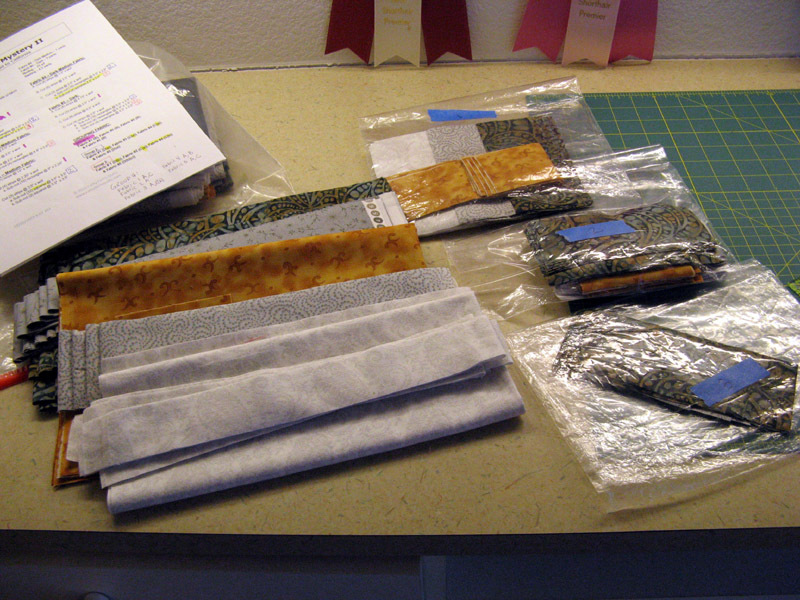 I've got a lot on my table to sew to be ready. Oh did I mention my quilt's name? I'm calling it Kotton. Today I will be discussing with my quilting sisters just what fabrics to try first in my Lily Block (UFO #6) of Kourageous. There will be four flower fabrics, two leaf/stem fabrics and one of the two backgrounds to use in the block. The primary flower fabric will be from the "jungle"; that is one of the animal skin prints. 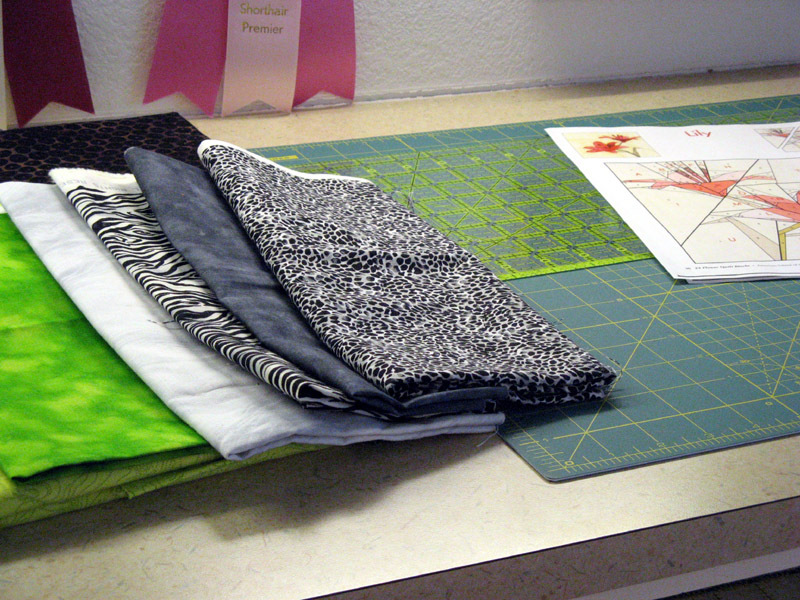 The other three fabrics will be from the "solids". I'm really liking the first fabric on the left and the more electric greens. Opinions and suggestions always welcome. 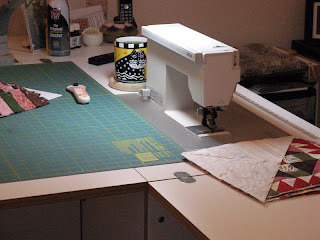 Hope you have something fun going on in your sewing room. Other Design Walls can be found through Patchwork Times (there's a link on the button at the right). I have a great start to my 2011 start of the stash reporting year... How about you? I was able to finish Kamel Kountry a Bonnie Hunter design that she calls Old Tobacco Road. Now I am down to working on just one of her mysteries; her current one Roll Roll, Cotton Boll. We have one more clue to go that will be released next Friday. This last clue will be the borders where I am certain she will have something that will finish the design just perfectly. Clue 7 revealed the quilt's design that I am very excited about. I really like that it is set on point with all the neutral string block 1 cut up and rearranged between block 2. I have not started working on this clue yet since I wanted to finish Kamel Kountry first. Challenge #6 UFO was selected for January. For me it will be the Lily. I am not sure what fabrics from the "jungle" will be selected, but am thinking about a leopard print that is in gray, white, and black tones as the main petals (first fabric on the left). 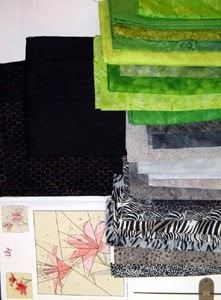 I will need four flower fabrics, two leaf/stem fabrics as well as picking one of the two background fabrics. I will use whatever background works best for the entire project. I'm calling this project Kourageous. There will be lots of auditions on each block, especially this first block!